XL Video supplied projection, video, lighting and audio design, plus equipment and crew to the annual AIR 2014 conference, staged at the Hotel Scandic in Copenhagen. XL Video collaborated with full-service international Event Management Company Ashfield Meetings & Events and global healthcare communications agency QXV Communications, an Ashfield Healthcare company, who were working for end client InterMune, a Swiss biotechnology company focused on the research, development and commercialization of therapies in pulmonology and orphan fibrotic diseases. The conference was attended by 340 delegates from around the globe including leading respiratory physicians and specialists. XL’s Project Manager was Andy Mayneord. The job always starts – as with AIR conferences in the past – with site visits several months in advance to assess the venue, followed by comprehensive CAD drawings and visuals of the set and design proposals which are then presented to the client. As well as the video, projection and audio services, XL Video also supplied photography for the event. XL was also asked to produce a 5-minute closing video, for which Mayneord engaged AVinteractive, whose team of Marc Shuttleworth and Tom Alexander were briefed by InterMune. The content included a vibrant mix of vox-pops and highlights of the event complete with graphics produced during the final edit. The conference featured a main plenary area with stage set, twin screen projection and a plasma lectern, plus two breakout rooms each with single screen rear projection and six channels of radio mics. The AIR conference stage designed by Andy Mayneord and Rich Carleton. The overall concept was based around the idea of ‘pure’, so the room and all the presentational aesthetics and graphics followed this lead, with everything predominantly white, interspersed with twists of lilac and blue in line with the AIR meeting logo. The environments were designed jointly by Andy Mayneord and Rich Carleton from Creative Event Services (CES) who supplied and built the set and its internal lighting. Two 5-by-3.5 meter screens were integrated into the set, and fed by two of XL’s Panasonic 12K Projectors. 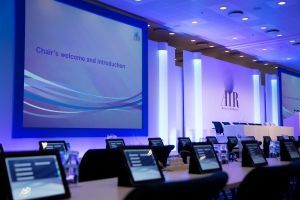 The content was a mix of graphics, PowerPoint & Keynote presentations, PlaybackPro video clips, iPad content and a single camera ISO record to KiPro also provided by XL, together with a full d&b audio system. XL was also asked to supply a lectern with a plasma front, so together with CES, they designed a bespoke lectern utilizing a 50” plasma screen and a PC to display speaker name slides in portrait format. The PA utilized d&b Q7 speakers overhead, with three E3s for front fills and relays, mixed via a 32-channel Yamaha LS9 console. Also included in the audio package were 12 channels of Shure Q5 radio mics plus lectern mics. The two breakout rooms were set up with a set and stage with the rear projection via Panasonic 6K machines. PowerPoint together with iPad content was relayed to screen via a Barco DCS902 switcher. Says Mayneord, “All the advance work really paid off in terms of smooth running once on site, and this was a great example of how XL can provide full service technical solutions. It was very satisfying to be involved in all aspects of an event like this, and to work hand-in-hand with the teams at QXV Communications and Ashfield Meetings & Events. There was a real synergy between us, and the end results produced a stylish, coherent and technically efficient result for the client." XL also transported all the gear, with the artic driven to Copenhagen by Alan Graham.